OTC scope of work : Manpower provision for different areas including technical engineering specialists, administration specialists and labor; delivery of transportation services: cars, minibuses, buses, provision of qualified and certified drivers; agency and facilitation services. Sakhalin-1 Project is one of the largest projects in Russia with direct foreign investments. The purpose of the Project is development of Arkutun-Dagi field located offshore in the distance of 25 km in the north-east of Sakhalin Island. Produced crude oil to be transported from the AD field to existing Chayvo Onshore Processing Facility (OPF) and then via the well-stream flow line to De-Kastri export terminal for further exporting. All drilling works and wells services to be carried out from the platform fixed in the depth of 35 m in the sea. The field will be developed using a Gravity Base Substructure (GBS) – four concrete shafts will support the integrated topside structure that includes a drilling rig, processing facilities, living quarters and associated utilities. The platform will become the first ExxonMobil operated platform equipped with friction pendulum bearing isolators to make it more seismically stable. 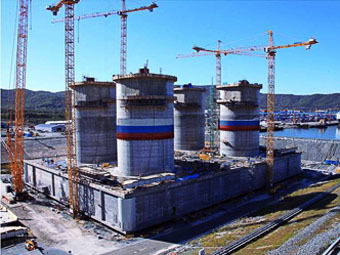 Aker Solutions (in May 2011 Kvaerner was established as a separate company) has been awarded contracts from Exxon Neftegas Limited, as operator on behalf of Sakhalin-1 Consortium, for engineering, procurement and construction of Arkutun-Dagi GBS for Sakhalin-1 project. The GBS is fabricated in dry dock close to Vrangel settlement. When it is completed, the GBS will be towed from the fabrication basin to Arkutun-Dagi field.